If you are my age or older and American, then you were probably in elementary school during the Cold War. If you went to a public school, there is a good chance you remember this rule: If there is a nuclear attack, you should stay calm and get underneath your desk! Your probably remember this mainly because as you got older there came a point where you thought: “WHAT THE HELL? How is a desk supposed to protect me if a nuclear bomb explodes anywhere near where I am?” So, usually by middle school and certainly by high school this became the brunt of many jokes. It became an example of how stupid and ridiculous adults are, or how stupid and ridiculous the public school system is, or whatever. Her second point is a good one. Children shouldn’t have to worry about that kind of thing. 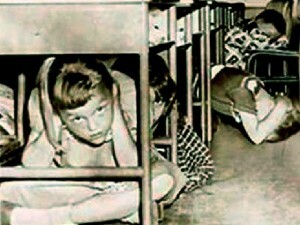 But I’m surprised that she hasn’t, as an adult, figured out what was going on with “duck and cover”. It was never meant to shield children from a nuclear blast. COME ON! You are an adult now. Think about it for just a second from an adult perspective. You are in charge of a school or a classroom, and there has just been an announcement that the United States is under nuclear attack. You don’t know how far away the nearest bomb will hit, you don’t know whether parents have been notified, you don’t really know anything yet, except that in all likelihood people are going to completely freak out. What does it accomplish if each child hiding under his or her desk? It’s a way of keeping order and calm. It’s a way of making sure children don’t go missing in a panic before their parents show up. It’s the single most obvious and sensible thing to do, from an adult administrative perspective. Of course it wasn’t explained this way to you when you were a kid, because you were a kid. Sure, when you were a teenager it was fun to make fun of the st00pid adults who thought that a wooden desk would protect you from a nuclear bomb. Ha, ha. But now that you’re an adult, can’t you see it? It really just takes a moment of thought. File this under: If you think something is obviously stupid, there is a good chance you got it wrong. There’s another reason, its to hide from falling objects and shattered glass, by hiding under your desk you’ll be safer from that. There is another reason for hiding under the desk, and that is pretty much the same as with earth quakes, that stuff may fall from the ceiling and you’d be a LITTLE safer under your desk. The direct effects of a nuke is a whole different story. I understand what you are saying in your article, but the reality is that Americans rarely deal with the reality of a situation. The reality is that you will be killed by a nuclear bomb. Hiding under a desk will not save you. The fundamental question is do you want to live the truth or live a lie. This is an important question. If they will lie about the effects of a nuclear bomb and the American people will fall for it like brainwashed sheep, what more will they lie about and to what lengths will the American public go to deny the truth? It is like 9/11. The evidence is overwhelming that the official story is nonsense. Office fires do not make buildings collapse. The ground does not swallow up 757s. The most secure building in the world with hundreds of cameras on it and surrounding it, should easily be able to produce one clear picture of the plane that crashed into it. All of these things are truths that America is just denying. Americans are just getting under their desks and hoping that the nuclear bomb won’t kill them. Thanks for your comment! However, based on what you said here, I’m not sure you DID understand what I was trying to say in the article. Maybe I wasn’t clear. The whole idea of getting children to go under their desks wasn’t because it was supposed to protect them from a nuclear blast. It was to help minimize chaos and panic by giving them something structured to do that would keep them in place. I don’t actually remember anyone ever specifically saying that the desks would “save you” from a nuclear bomb… only that that is what we were “supposed to do”, as children. I also don’t personally care for the 9/11 truther nonsense you veered into in the second part of your comment, but I suppose we’ll have to agree to disagree on that. It doesn’t really have any bearing on the rest of the conversation, it seems to me. I call bu11sh1t on this explanation. First…..in elementary school during the cold war the students didn’t know a damn thing about what was going on in the world outside the classroom during the day. They only knew what the teacher let them know…..if the teacher knew anything at all. Wasn’t like they were sporting smart phones in the 60s. Why would kids be running down the halls screaming? To keep order they don’t need to be told anything. The teacher would likely not know what’s going on until too late anyway. Second…..How is it easier to see if a kid is missing by looking under desks? If kids are under desks you can’t even see them if they’re in the back of the room. They’re easier to see if they’re sitting just where they should be…..in their chairs. The photo you chose proves this. If we’re smart enough to know that a desk won’t shield a kid from a nuclear blast then why tell them anything? Remaining calmly in their seats would be the best case scenario. If a bomb does hit nearby then they’re vaporized….if not, then none of the kids is the wiser. Third….amongst me and my schoolmates the thing that affected us the most, scared the crap out of us and put us on the border of panic was GETTING ON THE FLOOR UNDER OUR DESKS!!! At elementary school age we didn’t really understand what the Cold War was or what the ramifications were. All we knew was there was this vague entity that might want to destroy us. Every time we got on the floor it SCARED THE S81T out of us and we were anxious for the rest of the day and maybe for weeks if we did the drill enough. If this had happened in a non-drill situation we would have really freaked out. In the 50’s and 60’s we did what our teachers told us to do. They were revered almost as much as our parents. If they told us to sit calmly and everything would be ok we would for the most part have believed them and complied. No need for the fear and panic inducing “duck and cover”. I understand what you are saying, although I still disagree. Whenever there is a chance of panic and chaos, the best thing to do (from a management perspective) is to have ritual: a ritual that people can focus their minds on, that can keep them in a particular place and doing a particular thing. Your points all seem to imply that classrooms could simply continue as normal, and everything would be fine without any drills, because the children would be none the wiser, and everyone would be calm if they just sat at their desks. I suppose it’s true that that MIGHT happen. It might be the case in some or many schools that the students would never find out, the teachers would not panic, and if the students were told to stay in their seats they would do exactly that and nothing else. But there is no way to ensure that. All it takes is sirens going off in the distance (if you are in a large enough city that it has warning klaxons), one announcement, one rumor, or one teacher panicking … and suddenly, there are students scattered everywhere. So I don’t think “just pretend its not happening” is the best advice one can give to a school, from an administrative perspective. I think it makes more sense to make children aware that there IS an emergency going on, and that to make sure that they have something that is OUT of the ordinary to do — to latch on to, as it were — in those circumstances. I think that is what the ritual of the “duck and cover” was, in part, for. Mr. Stevens, you are correct. A ritual, especially one that is practiced as an emergency procedure, does help the teacher to maintain some sense of order during a crisis when children are afraid or anxious.